Beginning of the Talmudic Age. Celebrated Babylonian amora and founder of the Academy of Sura; flourished in third century; died at Sura in 247. His surname, "Arika" (Aramaic, ; Hebrew, ; English, "Long"—that is, "Tall"; it occurs only once—Ḥul. 137b), he owed to his height, which, according to a reliable record, exceeded that of his contemporaries. Others, reading "Areka," consider it an honorary title, "Lecturer" (Weiss, "Dor," iii. 147; Jastrow, "Dict." s.v.). In the traditional literature he is referred to almost exclusively as Rab the Master (both his contemporaries and posterity recognizing in him a master), just as his teacher, Judah I., was known simply as Rabbi. He is called Rabbi Abba only in the tannaitic literature (for instance, Tosefta, Beẓah, i. 7), where a number of his sayings are preserved. He occupies a middle position between the Tannaim and the Amoraim, and is accorded the right, rarely conceded to one who is only an amora, of disputing the opinion of a tanna (B. B. 42a and elsewhere). 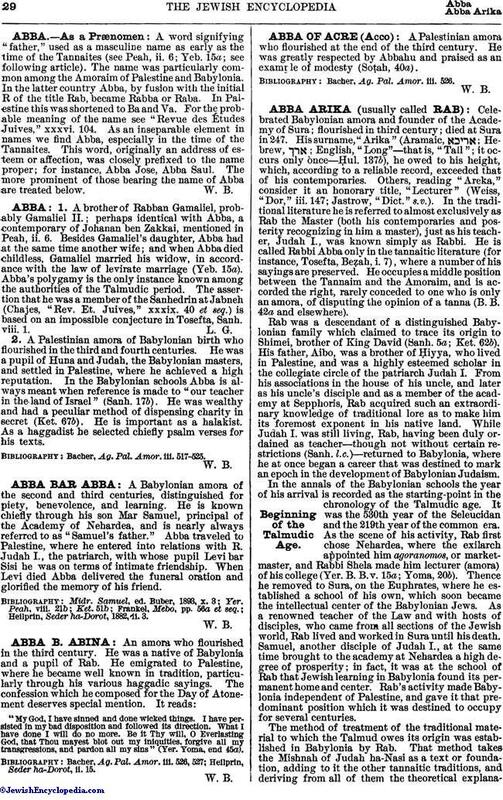 Rab was a descendant of a distinguished Babylonian family which claimed to trace its origin to Shimei, brother of King David (Sanh. 5a; Ket. 62b). His father, Aibo, was a brother of Ḥiyya, who lived in Palestine, and was a highly esteemed scholar in the collegiate circle of the patriarch Judah I. From his associations in the house of his uncle, and later as his uncle's disciple and as a member of the academy at Sepphoris, Rab acquired such an extraordinary knowledge of traditional lore as to make him its foremost exponent in his native land. While Judah I. was still living, Rab, having been duly ordained as teacher—though not without certain restrictions (Sanh. l.c. )—returned to Babylonia, where he at once began a career that was destined to mark an epoch in the development of Babylonian Judaism. In the annals of the Babylonian schools the year of his arrival is recorded as the starting-point in the chronology of the Talmudic age. It was the 530th year of the Seleucidan and the 219th year of the common era. As the scene of his activity, Rab first chose Nehardea, where the exilarch appointed him agoranomos, or market-master, and Rabbi Shela made him lecturer (amora) of his college (Yer. B. B. v. 15a; Yoma, 20b). Thence he removed to Sura, on the Euphrates, where he established a school of his own, which soon became the intellectual center of the Babylonian Jews. As a renowned teacher of the Law and with hosts of disciples, who came from all sections of the Jewish world, Rab lived and worked in Sura until his death. Samuel, another disciple of Judah I., at the same time brought to the academy at Nehardea a high degree of prosperity; in fact, it was at the school of Rab that Jewish learning in Babylonia found its permanent home and center. Rab's activity made Babylonia independent of Palestine, and gave it that pre-dominant position which it was destined to occupy for several centuries. The method of treatment of the traditional material to which the Talmud owes its origin was established in Babylonia by Rab. That method takes the Mishnah of Judah ha-Nasi as a text or foundation, adding to it the other tannaitic traditions, and deriving from all of them the theoretical explanationsand practical applications of the religious Law. 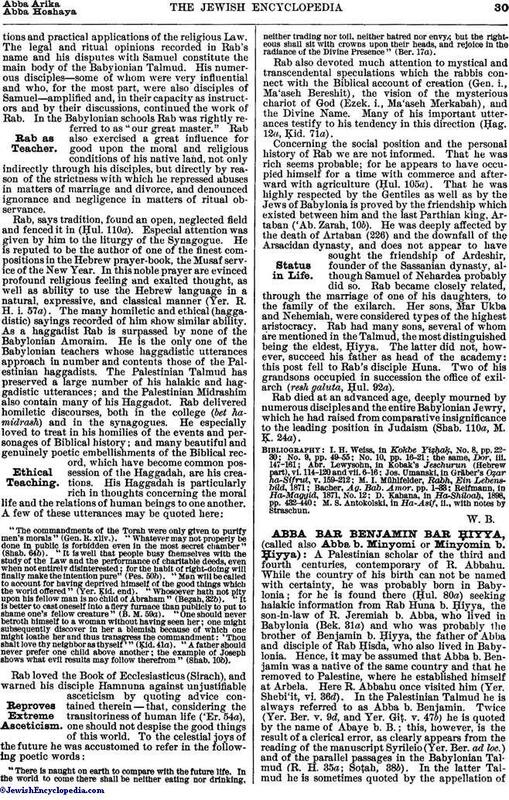 The legal and ritual opinions recorded in Rab's name and his disputes with Samuel constitute the main body of the Babylonian Talmud. His numerous disciples—some of whom were very influential and who, for the most part, were also disciples of Samuel—amplified and, in their capacity as instructors and by their discussions, continued the work of Rab. In the Babylonian schools Rab was rightly referred to as "our great master." Rab also exercised a great influence for good upon the moral and religious conditions of his native land, not only indirectly through his disciples, but directly by reason of the strictness with which he repressed abuses in matters of marriage and divorce, and denounced ignorance and negligence in matters of ritual observance. "The commandments of the Torah were only given to purify men's morals" (Gen. R. xliv.). "Whatever may not properly be done in public is forbidden even in the most secret chamber" (Shab. 64b). "It is well that people busy themselves with the study of the Law and the performance of charitable deeds, even when not entirely disinterested; for the habit of right-doing will finally make the intention pure" (Pes. 50b). "Man will be called to account for having deprived himself of the good things which the world offered" (Yer. Ḳid. end). "Whosoever hath not pity upon his fellow man is no child of Abraham" (Beẓah, 32b). "It is better to cast oneself into a fiery furnace than publicly to put to shame one's fellow creature" (B. M. 59a). "One should never betroth himself to a woman without having seen her; one might subsequently discover in her a blemish because of which one might loathe her and thus transgress the commandment: 'Thou shalt love thy neighbor as thyself'" (Ḳid. 41a). "A father should never prefer one child above another; the example of Joseph shows what evil results may follow therefrom". "There is naught on earth to compare with the future life. In the world to come there shall be neither eating nor drinking, neither trading nor toil, neither hatred nor envy; but the righteous shall sit with crowns upon their heads, and rejoice in the radiance of the Divine Presence". Rab also devoted much attention to mystical and transcendental speculations which the rabbis connect with the Biblical account of creation (Gen. i., Ma'aseh Bereshit), the vision of the mysterious chariot of God (Ezek. i., Ma'aseh Merkabah), and the Divine Name. Many of his important utterances testify to his tendency in this direction (Ḥag. 12a, Ḳid. 71a). Concerning the social position and the personal history of Rab we are not informed. That he was rich seems probable; for he appears to have occupied himself for a time with commerce and afterward with agriculture (Ḥul. 105a). That he was highly respected by the Gentiles as well as by the Jews of Babylonia is proved by the friendship which existed between him and the last Parthian king, Artaban ('Ab. Zarah, 10b). He was deeply affected by the death of Artaban (226) and the downfall of the Arsacidan dynasty, and does not appear to have sought the friendship of Ardeshir, founder of the Sassanian dynasty, although Samuel of Nehardea probably did so. Rab became closely related, through the marriage of one of his daughters, to the family of the exilarch. Her sons, Mar Ukba and Nehemiah, were considered types of the highest aristocracy. Rab had many sons, several of whom are mentioned in the Talmud, the most distinguished being the eldest, Ḥiyya. The latter did not, however, succeed his father as head of the academy: this post fell to Rab's disciple Huna. Two of his grandsons occupied in succession the office of exilarch (resh galuta, Ḥul. 92a). Rab died at an advanced age, deeply mourned by numerous disciples and the entire Babylonian Jewry, which he had raised from comparative insignificance to the leading position in Judaism (Shab. 110a, M. Ḳ. 24a). M. S. Antokolski, in Ha-Asif, ii., with notes by Straschun.